Thank you, Matt, for reminding us how perceptive Neustadt was. Question: Even as a weak president, isn’t Trump capable of doing great harm to the country through his foreign policy powers, which he mostly does not share with the other two branches of government. MATTHEW: First, thank you for including me in that post. I seem not to hear from you anymore after the discussion on the imbroglio at Middlebury. I’m still curious if that fracas resulted in a drop in enrollment or not. It certainly did at Evergreen with lots of faculty and support staff losing their jobs. I have a proposal on how to fix our immigration laws, which I’ll paste in below. If you don’t think it appropriate, just delete it. The key point is that If we mustered the political courage and will to do these things, we would not need a wall and could totally avoid this costly mess. This is a very simple solution. The Democrats (and some Republicans) have to agree to major changes in the laws about immigration in general, especially illegal immigration. They snookered Ronald Reagan in 1986 when he legalized 3,000,000 illegals (rumor has it he was told it was 300,000 but he kept his word anyway) with a promise to reform the immigration system so that people landing here illegally could be immediately sent back. Dems reneged on their promise. The Republicans are not forgetting that you cannot trust the Dems to keep their word on immigration. Pass the laws as a package. First: All illegal immigrants crossing our borders MUST be returned to their own countries or remain in Mexico while their claims are processed by our Justice system. They CANNOT BE RELEASED into the United States with a promise to show up for their hearing some years later. Too many disappear permanently. Second, all immigrants coming on legitimate VISAs MUST check in monthly at a minimum. VISA over-stays are a major source of illegal immigration, around 630,000 in 2016. They must be fingerprinted and photographed for facial recognition so as to make it much harder to disappear in our vast country. And we need to develop a tracking system, which we have not done despite it being called for by Congress. Third, we MUST eliminate chain migration because that is bringing everyone and their distant relatives out of countries that are totally dysfunctional, mostly because of fighting about religion, Muslims, Christians, Animists, etc., AND, tribal fighting. We don’t need that mental set here. We have enough problems as it is. Stay home and fix your countries. Fourth, the law must be changed so illegals who arrive in shiploads of containers are immediately sent back to their countries of origin. Same with those arriving from Canada. Fifth, employers who hire MUST know the immigration status of their hires. If they don’t check, then THEY are liable for BIG fines and prison time. Here’s the method to stay legal. And STOP giving SS cards, drivers licenses, welfare cards, etc., to illegals. Stop the “free stuff” that we don’t even give to our own citizens. The entire Left coast is especially bad. Sixth, we must implement a strong, enforced guest worker program for people from Central America only. When the job is done, THEY GO BACK HOME. Germany tried guest workers and they stayed and Germany didn’t send them back. That is causing a lot of trouble for Germany. So, our program has to have rigorous tracking that insures the people leave. If the DEMS will not agree to this, or something very much like it, then WE KNOW that they are FOR TOTALLY OPEN BORDERS because the immigrants tend to vote Democratic and they are trying to subvert the United States’ balance between parties. For every 770,000 increase in population that the census bureau counts (they count EVERYONE) a state can get another person in the House of Representatives. So, California currently gets about five Representatives because of all the illegals in that one state. They love it. They also get Big Bucks from the Feds based on their population. Matt- thanks for sharing this – it is my second year to receive this and it is a welcome reminder of the positive contribution a careful and perceptive academic can make! I look forward to your analysis/estimate of what Neustadt’s might “make” of Trump. In particular, I’m interested in how the use of twitter and the opposition of the MSM have introduced additional levers of influence that the President must take account of and can employ. I suggest that Trump may be able to exercise more unconventional power through his use of the media (and his prodigious communication skills) to reach his base directly – he has all but captured the Republican party, including almost all of their representatives. I can’t recall a similar situation, although perhaps Ross Perot’s campaign suggests some parallels. In any event, I suggest that there are additional institutional factors and players that Neustadt would be unfamiliar with and I look forward to your perspective on what he might make of their interaction with the institutional structure he was familiar with. I would be cautious in translating “policies I don’t agree with” into “great harm to the country”! Remember, he is pursuing foreign policies that in almost every case he campaigned and won the presidency by promising to do. I would add that Congress is perfectly capable of blocking his foreign policy – if it was so inclined. 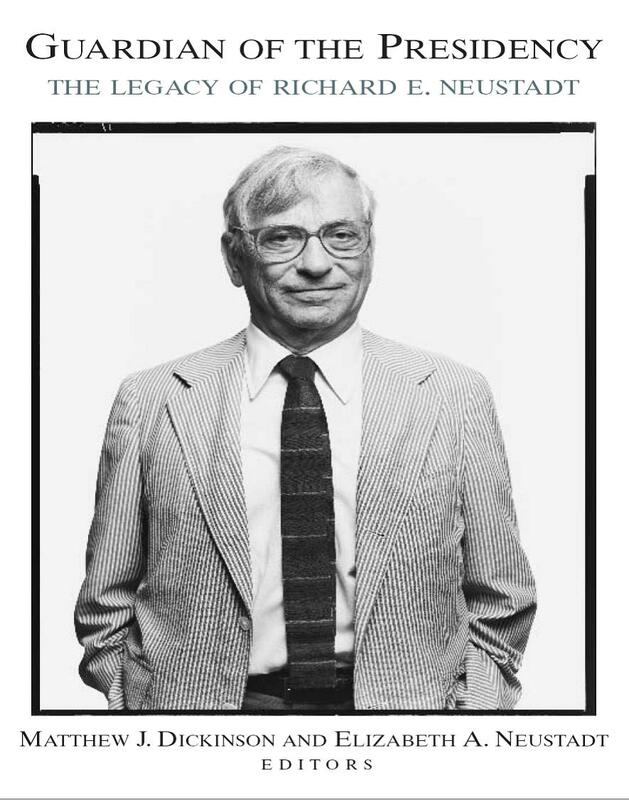 You are right that Neustadt wrote long before the movement to the digital media age. What that development says regarding his understanding of presidential power is an important question – one that political scientists are eagerly studying. My initial reaction is that there is less here than meets the eye, but I admit that we don’t really possess a complete understanding regarding how these developments, including the rise of social media, have impacted presidential power. But I’ll have more to say about this in future posts. Thank you, Matt, for this wonderful essay. It warms my heart. Thanks – It came from mine!